A state of matter is a distinct form, or a phase, of matter in physics. There are four main states of matter which are known as solid, liquid, gas, and plasma, including the physical changes. Another term for states of matter is known as a physical state which is often described as a phase. A phase is basically a set of a physical system that have a correct composition and properties of a physical state. Usually people are confused between a physical state and a phase. The component particles (atoms, molecules, or ions) are arranged differently in different states of matter. Other than the fundamental four, over 500 more states of matter are known, such as the neutron degenerate matter, glass, liquid crystal, but they only occur in extreme conditions such as extreme hot, near absolute zero, and some, like the Bose-Einstein condensate, can only be created in a lab. Other states, such as quark gluon plasma and dark matter, are only theoretically possible for now. A solid is a state of matter where the component particles are so close together that the force of attraction between the atoms don't allow the particles to move around freely, but they can only vibrate; the component particles are also arranged in a specific pattern in each substance. A solid has a define shape. It's volume and density can change slightly due to the temperature changes, but most people ignore that fact and say that a solid has a fixed volume and density. Solids remain in their fixed shape even if there isn't a container. They can, however, change their shape when broken, cut, or affected by other forces. Solid particles are close together which makes them vibrate against each other. A solid is difficult to form by hand and squeeze by pressure into a smaller volume. If heated, solids will expand by a little bit; a solid has a definite shape and a definite volume. 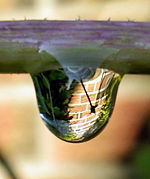 A liquid is a fluid state of matter where the particles are far away from each other enough to move around a little bit. The arrangement of the particles in a liquid is not as orderly as a solid matter. The reason for this is that liquids are free to flow around each other from one location to another. Liquid matter forms the shape of the container that is given. However, even if the liquid forms to the shape of a container, the volume doesn't change as much as a gas - but as temperature rises, the volume of the liquid increases, making convection possible in liquids. The liquid forms in a type of vaporization at a certain temperature by a definite amount of pressure. Liquids are unyielding to pressure or force, but when they are heated they tend to expand slightly. The highest temperature at which a given liquid can exist is its critical temperature. A hot air balloon is powered by hot gases. Gases have a indefinite shape and volume and are easily compressed to form the shape of the container. Gases are similar to liquids because they form the shape that a container is formed. The particles for a gas have a wide difference apart from liquid particles. They are farther apart from each other which tends to go all over the place. Since the particles are widely apart, the space between gases is easily pressed together into a smaller volume. Another word that can be used as gas is called vapor. The word vapor and gas are used exchangeably from time to time. However, there are differences between the two words. Gas is used when we describe substances such as oxygen, that forms at a gaseous state of room temperature. A visible exhalation, known as vapor, mainly gives an explanation about the state of a substance in a gaseous atmosphere usually in a liquid or a solid at a room temperature. In a plasma, electrons are ripped away from their nuclei, making the substance conduct electricity. Like a gas, plasma does not have definite shape or volume. Unlike gases, plasmas are electrically conductive, produce magnetic fields and electric currents, and respond strongly to electromagnetic forces. Positively charged nuclei swim in an ocean of freely-moving disassociated electrons, similar to the way such charges exist in conductive metal. In fact it is this electron sea that allows matter in the plasma state to conduct electricity. The plasma state is often misunderstood, but it is actually quite common on Earth, and the majority of people observe it on a regular basis without even realizing it. Fire, lightning, electric sparks, fluorescent lights, neon lights, plasma televisions, and the stars are all examples of illuminated matter in the plasma state. A phase change is a change in the arrangement and structure of the component particles of an object and can be recognized by an abrupt change in properties. A distinct state of matter can be defined as any set of states distinguished from any other set of states by a phase transition. An object can change its state of matter depending on pressure and temperature conditions, transitioning to other phases as these conditions change to favor their existence; for example, solid transitions to liquid with an increase in temperature. Near absolute zero, a substance exists as a solid. Forms of matter that are not composed of molecules and are organized by different forces can also be considered different states of matter, such as superfluids (like Fermionic condensate) and the quark–gluon plasma. Glass is an amorphous (not crystalline) solid. It's component particles are not arranged in a crystal, like in ice. Thermodynamically, a glass is in a metastable state with respect to its crystalline counterpart. The conversion rate, however, is practically zero. Regular hexagonal pattern of Si and O atoms, with a Si atom at each corner and the O atoms at the centre of each side. The liquid crystals are states of matter that has properties of both conventional liquid and solid crystal. For instance, a liquid crystal may flow like a liquid, but its molecules may be oriented in a crystal-like way. There are many liquid crystal states, however, and they can be distinguished by their different optical properties. Thermotropic liquid crystals can only exist within a certain temperature range. If the temperature is too high, the thermotropic liquid crystal will melt into liquids; and if the temperature is too low, the thermotropic liquid crystal will freeze to a conventional solid. Alignment of particles in a nematic phase. One of the most common thermotropic liquid crystal phases is the nematic phase. The word "nematic" comes from the Greek νήμα (nema), which means "thread". This term originates from the thread-like topological defects observed in nematics, which are formally called 'disclinations'. Nematics also exhibit so-called "hedgehog" topological defects. In a nematic phase, the calamitic or rod-shaped organic molecules have no positional order, but they self-align to have long-range directional order with their long axes roughly parallel. Thus, the molecules are free to flow and their center of mass positions are randomly distributed as in a liquid, but still maintain their long-range directional order. Most nematics are uniaxial: they have one axis that is longer and preferred, with the other two being equivalent (can be approximated as cylinders or rods). However, some liquid crystals are biaxial nematics, meaning that in addition to orienting their long axis, they also orient along a secondary axis. Nematics have fluidity similar to that of ordinary (isotropic) liquids but they can be easily aligned by an external magnetic or electric field. Aligned nematics have the optical properties of uniaxial crystals and this makes them extremely useful in liquid crystal displays (LCD). Schematic of alignment in the smectic phases. 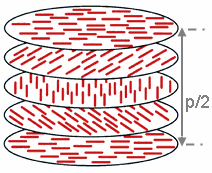 The smectic A phase (left) has molecules organized into layers. In the smectic C phase (right), the molecules are tilted inside the layers. Schematic of ordering in chiral liquid crystal phases. The chiral nematic phase (left), also called the cholesteric phase, and the smectic C* phase (right). Chiral nematic phase; p refers to the chiral pitch (see text). Although blue phases are of interest for fast light modulators or tunable photonic crystals, they exist in a very narrow temperature range, usually less than a few kelvin. Recently the stabilization of blue phases over a temperature range of more than 60 K including room temperature (260–326 K) has been demonstrated. Blue phases stabilized at room temperature allow electro-optical switching with response times of the order of 10−4 s.
Structure of lyotropic liquid crystal. 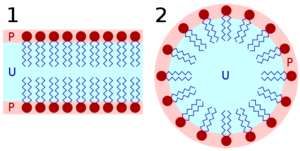 The red heads of surfactant molecules are in contact with water, whereas the tails are immersed in oil (blue): bilayer (left) and micelle (right). A lyotropic liquid crystal is a liquid crystal state consists of two or more components that exhibit liquid-crystalline properties in certain concentration ranges. In the lyotropic phases, solvent molecules fill the space around the compounds to provide fluidity to the system. In contrast to thermotropic liquid crystals, these lyotropics have another degree of freedom of concentration that enables them to induce a variety of different phases. A micellar cubic phase is a lyotropic liquid crystal phase formed when the concentration of micelles dispersed in a solvent (usually water) is sufficiently high that they are forced to pack into a structure having long-ranged positional (translational) order. For example, spherical micelles a subic packing of a body-centred cubic lattice. Normal topology micellar cubic phases, denoted by the symbol I1, are the first lyotropic liquid crystalline phases that are formed by type I amphiphiles. The amphiphiles' hydrocarbon tails are contained on the inside of the micelle and hence the polar-apolar interface of the aggregates has a positive mean curvature, by definition (it curves away from the polar phase). Inverse topology micellar cubic phases (such as the Fd3m phase) are observed for some type II amphiphiles at very high amphiphile concentrations. These aggregates, in which water is the minority phase, have a polar-apolar interface with a negative mean curvature. The structures of the normal topology micellar cubic phases that are formed by some types of amphiphiles (e.g. the oligoethyleneoxide monoalkyl ether series of non-ionic surfactants are the subject of debate. Micellar cubic phases are isotropic phases, but are distinguished from micellar solutions by their very high viscosity. When thin film samples of micellar cubic phases are viewed under a polarising microscope they appear dark and featureless. Small air bubbles trapped in these preparations tend to appear highly distorted and occasionally have faceted surfaces. Schematic of the molecular organisation in a type I hexagonal lyotropic liquid crystalline phase. (Click the picture to see a higher solution. A hexagonal phase of lyotropic liquid crystal is formed by some amphiphilic molecules when they are mixed with water or another polar solvent. In this phase, the amphiphile molecules are aggregated into cylindrical structures of indefinite length and these cylindrical aggregates are disposed on a hexagonal lattice, giving the phase long-range orientational order. In normal topology hexagonal phases, which are formed by type I amphiphiles, the hydrocarbon chains are contained within the cylindrical aggregates such that the polar-apolar interface has a positive mean curvature. 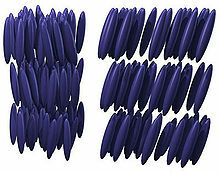 Inverse topology hexagonal phases have water within the cylindrical aggregates and the hydrocarbon chains fill the voids between the hexagonally packed cylinders. Normal topology hexagonal phases are denoted by HI while inverse topology hexagonal phases are deonted by HII. When viewed under a polarising microscope, thin films of both normal and inverse topology hexagonal phases exhibit birefringence, giving rise to characteristic optical textures. Typically, these textures are smoke-like, fan-like or mosaic in appearance. The phases are highly viscous and small air bubbles trapped within the preparation have highly distorted shapes. Size and shapes of lamellar, micellar and hexagonal phases of aqueous lipid dispersions can be easilty identified and characterized by negative staining transmission electron microscopy too. Smokey optical texture of type I hexagonal phase. Mosaic optical texture of type I hexagonal phase. Mosaic/focal conic optical texture of type I hexagonal phase. A metallotropic liquid crystal is a liquid crystal based on low-melting inorganic phases like ZnCl2 that have a structure formed of linked tetrahedra and easily form glasses. The addition of long chain soap-like molecules leads to a series of new phases that show a variety of liquid crystalline behavior both as a function of the inorganic-organic composition ratio and of temperature. This class of materials has been named metallotropic. 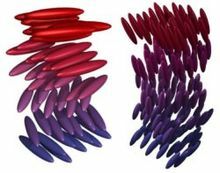 Magnets form when transition metal atoms often have magnetic moments due to the net spin of electrons that remain unpaired and do not form chemical bonds. In some solids the magnetic moments on different atoms are ordered and can form a ferromagnet, an antiferromagnet or a ferrimagnet. In a ferromagnet - for instance, solid iron - the magnetic moment on each atom is aligned in the same direction (within a magnetic domain). If the domains are also aligned, the solid is a permanent magnet, which is magnetic even in the absence of an external magnetic field. The magnetization disappears when the magnet is heated to the Curie point, which for iron is 768 °C. In condensed matter physics, a quantum spin liquid is a state that can be achieved in a system of interacting quantum spins. The state is a "liquid" because it is a disordered state in comparison to a ferromagnetic spin state, much in the way liquid water is in a disordered state compared to crystalline ice. However, unlike other disordered states, a quantum spin liquid state preserves its disorder to very low temperatures. Close to absolute zero, some liquids form a second liquid state described as superfluid because it has zero viscosity (or infinite fluidity; i.e., frictionless). 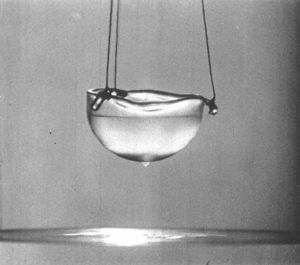 This was discovered in 1937 for helium, which forms a superfluid below the lambda temperature of 2.17 K. In this state it will attempt to "climb" out of its container. It also has infinite thermal conductivity so that no temperature gradient can form in a superfluid. Placing a superfluid in a spinning container will result in quantized vortices. A fermionic condensate is a superfluid phase formed by fermionic particles at low temperatures. It is closely related to the Bose–Einstein condensate, a superfluid phase formed by bosonic atoms under similar conditions. Unlike the Bose–Einstein condensates, fermionic condensates are formed using fermions instead of bosons. The earliest recognized fermionic condensate described the state of electrons in a superconductor; the physics of other examples including recent work with fermionic atoms is analogous. The first atomic fermionic condensate was created by a team led by Deborah S. Jin in 2003. A chiral condensate is an example of a fermionic condensate that appears in theories of massless fermions with chiral symmetry breaking. In the year of 1924, Albert Einstein and an Indian physicist Satyendra Nath Bose predicted that the condensation happens when the atoms change into an atom known as the "superatom". That is why this new idea or theory was known as the Bose-Einstein Condensate. Throughout the 71-year study of this theory, it was confirmed by many other physicist for the search of the mythical Holy Grail. This particular theory allows scientists to study the strange and unique world of physics as if they were searching or observing through a huge magnifying glass. Strange matter is a particular form of quark matter, usually thought of as a "liquid" of up, down, and strange quarks. It is to be contrasted with nuclear matter, which is a liquid of neutrons and protons (which themselves are built out of up and down quarks), and with non-strange quark matter, which is a quark liquid containing only up and down quarks. At high enough density, strange matter is expected to be color superconducting. Strange matter is hypothesized to occur in the core of neutron stars, or, more speculatively, as isolated droplets that may vary in size from femtometers (strangelets) to kilometers (quark stars). Under extremely high pressure, ordinary matter undergoes a transition to a series of exotic states of matter collectively known as degenerate matter. In these conditions, the structure of matter is supported by the Pauli exclusion principle. These are of great interest to astrophysicists, because these high-pressure conditions are believed to exist inside stars that have used up their nuclear fusion "fuel", such as the white dwarfs and neutron stars. A quark–gluon plasma (QGP) or quark soup is a phase of quantum chromodynamics (QCD) which is hypothesized to exist at extremely high temperature and/or density. This phase is thought to consist of asymptotically free quarks and gluons, which are several of the basic building blocks of matter. The strength of the color force means that unlike the gas-like plasma, quark-gluon plasma behaves as a near-ideal Fermi liquid, although research on flow characteristics is ongoing. In the quark matter phase diagram, QGP is placed in the high-temperature, high-density regime; whereas, ordinary matter is a cold and rarefied mixture of nuclei and vacuum, and the hypothetical quark stars would consist of relatively cold, but dense quark matter. Experiments at CERN's Super Proton Synchrotron (SPS) first tried to create the QGP in the 1980s and 1990s: the results led CERN to announce indirect evidence for a "new state of matter" in 2000. Current experiments (2011) at the Brookhaven National Laboratory's Relativistic Heavy Ion Collider (RHIC) on Long Island (NY, USA) and at CERN's recent Large Hadron Collider near Geneva (Switzerland) are continuing this effort,  by colliding relativistically accelerated gold (at RHIC) or lead (at LHC) with each other or with protons. Although the results have yet to be independently verified as of February 2010, scientists at Brookhaven RHIC have tentatively claimed to have created a quark-gluon plasma with an approximate temperature of 4 trillion (4×1012) degrees Celsius. As already mentioned, three new experiments running on CERN's Large Hadron Collider (LHC), on the spectrometers ALICE, ATLAS and CMS, will continue studying properties of QGP. Starting in November 2010, CERN temporarily ceased colliding protons, and began colliding lead Ions for the ALICE experiment. They were looking to create a QGP and were expected to stop December 6, colliding protons again in January. A new record breaking temperature was set by ALICE: A Large Ion Collider Experiment at CERN on August, 2012 in the ranges of 5.5 trillion (5.5×1012) degrees Celsius as claimed in their Nature PR. "Color" in the name "color-glass condensate" refers to a type of charge that quarks and gluons carry as a result of the strong nuclear force. The word "glass" is borrowed from the term for silica and other materials that are disordered and act like solids on short time scales but liquids on long time scales. In the "gluon walls," the gluons themselves are disordered and do not change their positions rapidly because of time dilation. 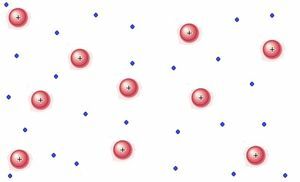 "Condensate" means that the gluons have a very high density. The color-glass condensate is important because it is proposed as a universal form of matter that describes the properties of all high-energy, strongly interacting particles. It has simple properties that follow from first principles in the theory of strong interactions, quantum chromodynamics. It has the potential to explain many unsolved problems such as how particles are produced in high-energy collisions, and the distribution of matter itself inside of these particles. Researchers at CERN believe they have created color-glass condensates during collisions of protons with lead ions. In these sorts of collisions, the standard outcome is that new particles are created and fly off in different directions. However, the Compact Muon Solenoid (CMS) team at the LHC found that in a sample of 2 million lead-proton collisions, some pairs of particles flew away from each other with their respective directions correlated. This correlation of directions is the anomaly that might be caused by the existence of a color-glass condensate while the particles are colliding. The gravitational singularity is predicted by general relativity to exist at the center of a black hole (the singularity; it is not a state of matter, even not a material object at all (although the mass-energy of matter contributed to its creation) but rather a property of spacetime at a location. It could be argued, of course, that all particles are properties of spacetime at a location, leaving a half-note of controversy on the subject. In condensed matter physics, a string-net liquid is an extended object whose collective behavior has been proposed as a physical mechanism for topological order by Michael A. Levin and Xiao-Gang Wen. A particular string-net model may involve only closed loops; or networks of oriented, labeled strings obeying branching rules given by some gauge group; or still more general networks. Their model purports to show the derivation of photons, electrons, and U(1) gauge charge, small (relative to the planck mass) but nonzero masses, and suggestions that the leptons, quarks, and gluons, can be modeled in the same way. In other words, string-net condensation provides an unification of photon and electron (or gauge bosons and fermions). It can be viewed as an origin of light and electron (or gauge interactions and Fermi statistics). However, their model does not account for the chiral coupling between the fermions and the SU(2) gauge bosons in the standard model. For strings labeled by the positive integers, string-nets are the spin networks studied in loop quantum gravity. This has led to the proposal by Levin and Wen, and Smolin, Markopoulou and Konopka that loop quantum gravity's spin networks can give rise to the standard model of particle physics through this mechanism, along with fermi statistics and gauge interactions. To date, a rigorous derivation from LQG's spin networks to Levin and Wen's spin lattice has yet to be done, but the project to do so is called "quantum graphity", and in a more recent paper, Tomasz Konopka, Fotini Markopoulou, Simone Severini argued that there are some similarities to spin networks (but not necessarily an exact equivalence) that gives rise to U(1) gauge charge and electrons in the string net mechanism. Herbertsmithite may be an example of string-net matter. Equilibrium gel is made from a synthetic clay called Laponite. Unlike other gels, it maintains the same consistency throughout its structure and is stable, which means it does not separate into sections of solid mass and those of more liquid mass. Equilibrium gel filtration liquid chromatography is a technique used for the quantitation of ligand binding. While dark matter is estimated to comprise 83% of the mass of matter in the universe, most of its properties remain a mystery due to the fact that it neither absorbs nor emits electromagnetic radiation (except for when a particle of dark matter collide with another particle of dark matter, they vanish into a gamma ray), and there are many competing theories regarding what dark matter is actually made of. Thus, while it is hypothesized to exist and comprise the vast majority of matter in the universe, almost all of its properties are unknown and a matter of speculation, because it has only been observed through its gravitational effects. Photonic molecules are a synthetic form of matter in which photons bind together to form molecules. According to Mikhail Lukin, individual (massless) photons "interact with each other so strongly that they act as though they have mass". The effect is analogous to refraction. The light enters another medium, transferring part of its energy to the medium. Inside the medium, it exists as coupled light and matter, but it exits as light. 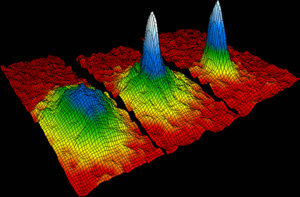 ↑ States of matter Wikipedia, the free encyclopedia, March 14, 2014, Multiple Authors. ↑ [books.google.com/?id=TxvUxFlQsEsC&printsec=frontcover Liquid Crystals] Cambridge: Cambridge University Press, 1992, Chandrasekhar, S.
↑ Thermotropic Biaxial Nematic Liquid Crystals Phys. Rev. Lett, 2004, Madsen, L. A.; Dingemans, T. J.; Nakata, M.; Samulski, E. T.
↑ Liquid Gold: The Story of Liquid Crystal Displays and the Creation of an Industry World Scientific Publishing, 2005, Castellano, Joseph A. ↑ Low threshold lasing at the edge of a photonic stop band in cholesteric liquid crystals Opt. Lett 23 (21), 1998, Kopp, V. I.; Fan, B.; Vithana, H. K. M.; Genack, A. Z. ↑ Introduction to Liquid Crystals Plenum Press, 1974, Priestley, E. B.; Wojtowicz, P. J. and Sheng, P.
↑ [www.physik.fu-berlin.de/~kleinert/75/75.pdf Lattice Textures in Cholesteric Liquid Crystals] Fortschritte der Physik, 1981, Kleinert H. and Maki K.
↑ Liquid crystal "blue phases" with a wide temperature range Nature 436 (7053), 2005, Coles, Harry J.; Pivnenko, Mikhail N.
↑ Polymer-stabilized liquid crystal blue phases Nature Materials 1 (1), 2002, Kikuchi H, Yokota M, Hisakado Y, Yang H, Kajiyama T.
↑ Metallotropic liquid crystals formed by surfactant templating of molten metal halides Nature Materials 5 (4): 271–5, 2006, Martin, James D.; Keary, Cristin L.; Thornton, Todd A.; Novotnak, Mark P.; Knutson, Jeremey W.; Folmer, Jacob C. W.
↑ Bose-Einstein condensation IOP Physics World, March 1, 1997, Multiple Authors. ↑ Hadron production from a boiling quark soup: quark model predicting particle ratios in hadronic collisions Nuclear Physics B 128 (2): 275, 1977, Bohr, Henrik; Nielsen, H. B. ↑ Superfluids and Supersolids on Frustrated Two-Dimensional Lattices Physical Review B, 1997, G. Murthy et al. This page was last modified on 25 May 2015, at 21:46.